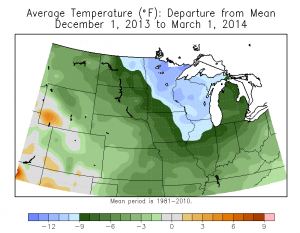 This winter has been significantly colder than average across the Corn Belt. The December-February temperatures were 9 to 12 degrees below average across Minnesota, Wisconsin, eastern Iowa, and northern Illinois. The rest of the Corn Belt was 6 to 9 degrees below average (map below). In addition, snowfall for the winter season was above average in the eastern two-thirds of the Corn Belt and near to slightly below average in the western third. Temperature departures for the period December 1, 2013 to March 1, 2014 for the central US. Click to enlarge. 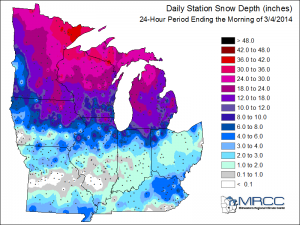 The results of this cold and snowy winter are that we have: 1) a significant snowpack in Minnesota, Wisconsin, Michigan, and in much of northern Iowa, Illinois, Indiana, and Ohio (see snow depth map below) and 2) frozen soils across much of the northern two-thirds of the Corn Belt. Snow depth (inches) as reported on the morning of March 4, 2014. Click to enlarge. It will take some time for the snow to melt and the soils to warm up and dry out. The latest forecasts from the National Weather Service Climate Prediction Center indicate that colder than average conditions will prevail for at least the next two weeks. A slow melt is desirable at this point in order to reduce the risk of flooding on rivers and streams. Soil moisture was in good shape going into winter in much of the eastern Corn Belt, but was below average in parts of the western Corn Belt. It remains to be seen how much of the snow melt will actually go towards recharging the soil moisture in those areas. It is likely that that the frozen soils will inhibit the recharge in many instances. While there are concerns of a slow start to the growing season due to the cold weather, circumstances could change rapidly, as they often do in the Midwest. A few weeks of warm weather and sunshine in April could put us back on track. Maps are courtesy of the Midwestern Regional Climate Center, Illinois State Water Survey and the University of Illinois. This entry was posted in Uncategorized, Weather and Agriculture and tagged snow, soil moisture, soil temperatures, spring, winter by Jim Angel. Bookmark the permalink. Jim Angel is the state climatologist for Illinois and co-investigator on the U2U project.